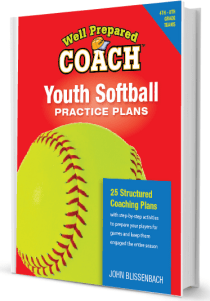 These softball practice plans are a great solution for you and your team. Are you ready to have your best year coaching? The first thing to consider: go into the season with plans that you can trust can make a huge difference. You won’t have to wing it. You’ll have such a better season with some preparation. Coaching can be a lot of fun, but it also comes with a set of challenges. As a result, the best way to address these challenges is to be prepared. From warm ups through hitting drills and a final word with your players, we’ve got you covered. Identify coaching concepts to address and the order to address them in – the right stuff to teach at the right time. Facilitate player development. The biggest winners of this system are the players! Save time because the planning is done. You won’t have to start from scratch; just review and tweak as needed for your team. Print out the plan and bring it with you to use as your guide. “Coach in the moment” by being focused on the task at hand, and consequently, you won’t have to worry about what to do next. This ebook includes agendas and teaching points for twenty‐five, 90‐minute practices and twenty‐five, 10‐minute, pre‐practice meetings. Don’t wing it — be ready. 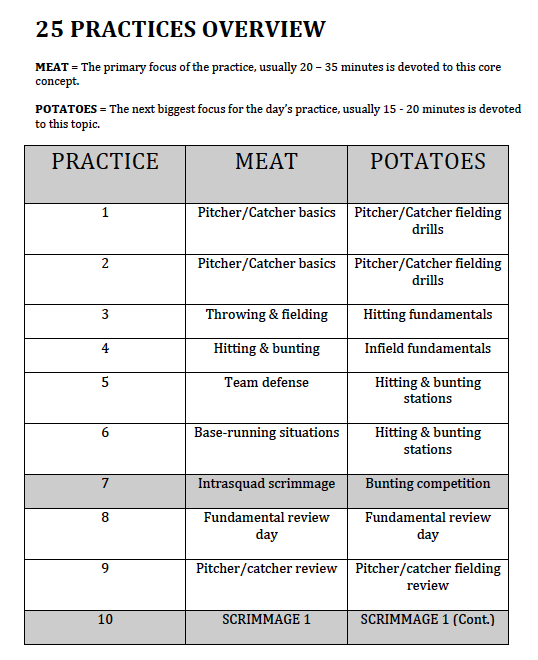 Having a plan like this brings confidence to the coaches, and it translates to the players. Check out these other great softball quotes. You’re ready in very little time. Just take 5 – 10 minutes to review the plans before practice, print out the plan for the day and you’re good to go. This coaching process works. John has coached for over 20 years. You don’t have to reinvent the wheel. Learn from an expert who has had success. You can coach in the moment because you don’t have to worry about what to do next. This gives you time to really enjoy coaching players. No longer do you have to worry about what the next drill will be and how to organize it. Players rapidly improve with this process. Coach in the right order, and keep you players engaged. John Blissenbach started as a high school assistant varsity/JV head coach working with varsity head coach Hank Mauer (Great uncle of Minnesota Twins All‐Star Catcher, Joe Mauer). John has coached all levels of youth softball. He has coached and managed championship youth & American Legion baseball teams. He began coaching baseball in 1979 at the age of 20. John has also been a coach for his 4 children’s baseball, football, basketball, track & soccer teams in addition to softball. During the past 20 years of coaching, he has had the great pleasure of coaching more than 50 youth (boys & girls) teams. Practices can be boring for players. 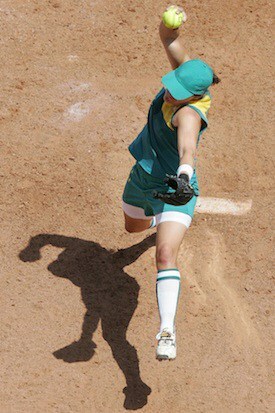 For many teams, they consist of warm-up catch, batting drills followed by a round of infield. Players spent a lot of time standing around watching other players hit and occasionally field a ball hit to them. Most coaches have little time to think about or prepare a plan. If as a coach, you would rather have fun, structured, fast‐moving practices loaded with fundamentals, then this book is for you. As you enter a new season, four things are certain; your players will be diverse in their skills and understanding of the game, there is great deal your players will need to learn, and finally, you will have a limited amount of time to prepare, as well as a limited amount of time during your session. How your players spend their time during practice will determine the success of your team’s season. What your players do and when they do it is entirely up to you. Your players are counting on you to be prepared so they can be prepared. 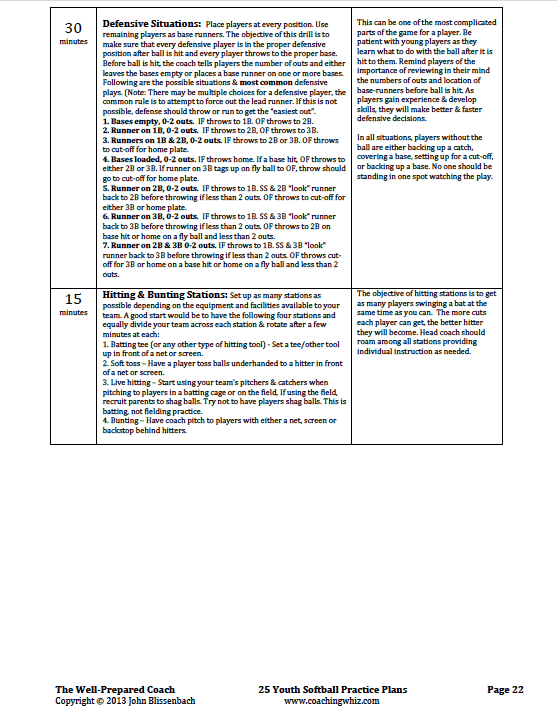 This guide is intended to make your coaching job a lot easier. If you’re new to coaching, you can use this guide as your road map. If you’ve coached before, this guide will remove a lot of the work associated with mapping out all the time you spend with your players. You can supplement our drills and schedule with your own concepts that have worked for you in the past. 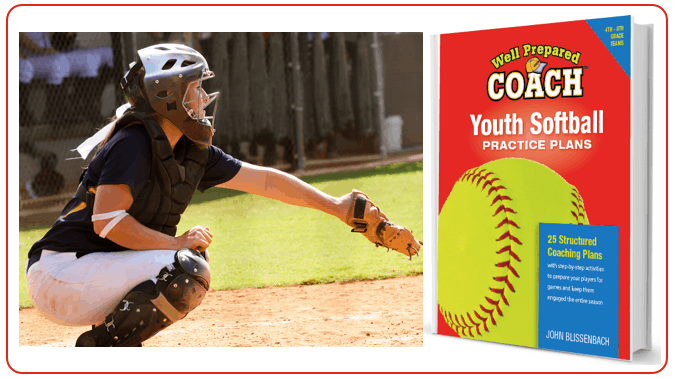 With your use of this guide, your players will be learning, having fun and picking up on the key softball concepts at the right time. As a coach, you’ll look experienced, knowledgeable and well prepared. Plus, with some of the heavy lifting removed from our schedule, you’ll have more time to appreciate the season. Enjoy! 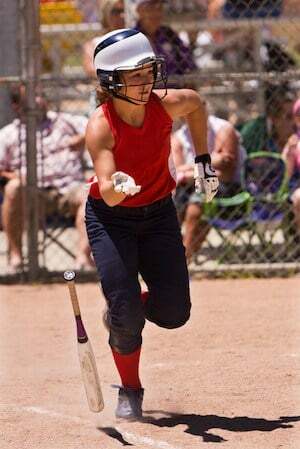 Fastpitch softball plans make a big difference. They’ll work for 10u up to high school. When you purchase this ebook, you’ll be immediately sent a link enabling you to download the PDF. The PDF file, which you’ll save to your computer, works on PCs and Macs. The book comes with an overview of the 25 practices. The first 10 look like. Here’s one, free plan for you to check out the format. Please note that each activity has a suggested time period. Coaches will sometimes go under or over on some activities based on how their teams respond. Don’t worry about making a few changes to each plan to customize them for your needs. 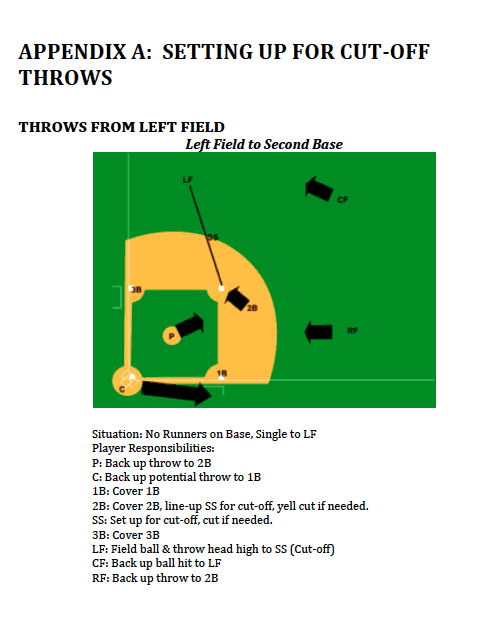 Additional appendix diagrams are included to make it easy for even the newest of coaches. These plans are available immediately as instant digital downloads. They come in PDF format which work on Macs and PCs. 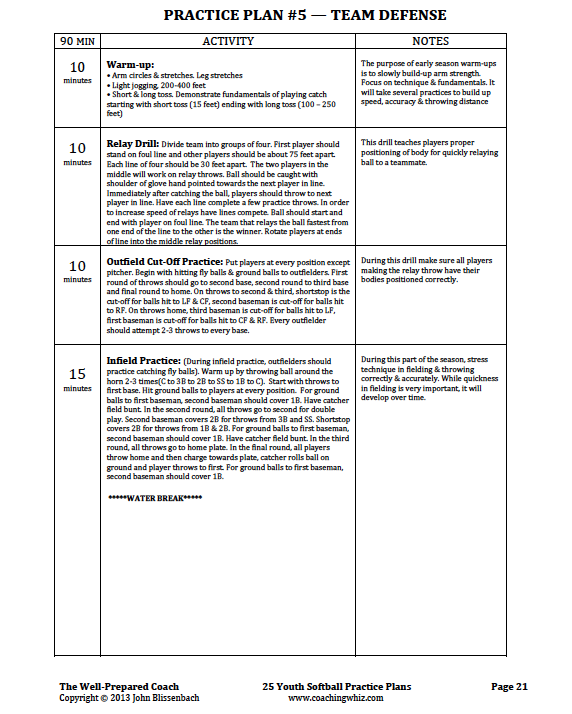 Save time and get the most from your players with this planner. Be the most prepared. Create a season to remember. As a result of this guide, you’re ready to go. You can make some adjustments to fit your needs, but you can also follow it pretty much minute-by-minute for your season’s road map. See the picture, sell the picture, paint the picture. Check out how this simple formula can make such a difference with you’re coaching a youth sports team: The Secret to Coaching Youth Sports. A big part of seeing the picture is to have a vision, and to have a plan. This guide will help you. You’ll received this via a download link so that you can immediately start in. 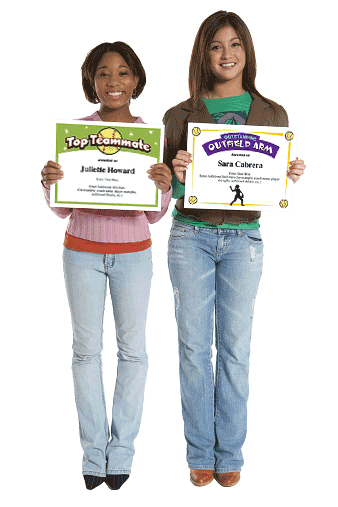 And, check out our certificates and training program. 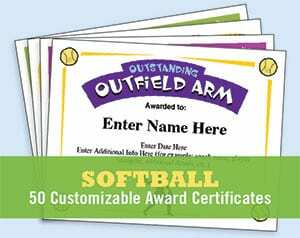 Give your players some lasting memories of a great season!